Paul Tarn has secured 10 places on a hard boat for Scapa Flow (Orkneys) 21-26 July 2019. Cost £670 per person. Includes diving, boat, accommodation on board Valkyrie and air fills. Does not include travel, meals or Nitrox. 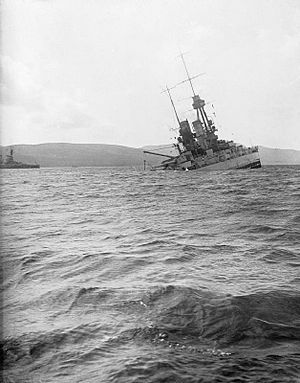 Following the German defeat in WWI, 74 ships of the Imperial German Navy’s High Seas Fleet were interned at Scapa Flow. On 21 June 1919, Rear Admiral Ludwig von Reuter made the decision to scuttle the fleet. A few of these warships remain and have become one of the world’s top dive destinations. Paul needs definite commitment and £250 per person deposit to secure the booking. Most diving is 25-35m, so you must be a minimum grade of sports diver. The club has dived this location previously. Please talk to Paul Richardson or Rob Mason for more details. Names to Paul Tarn ASAP via pam@tarn.org.uk as we need to pay deposit quickly to reserve boat.